The simplified product lineup also includes a high-capacity 128-gigabyte model for $299. As a result, Apple no longer offers a 64-gigabyte capacity, axing it along with the 16-gigabyte variety. The capacity options now match Apple's entry-level iPhone SE, which also doubled capacity earlier this year in a small refresh. The tweaked storage options for the iPod touch come about two years after the portable media player was updated with a 64-bit A8 processor. At the time, that was Apple's flagship A-series CPU, ensuring that the iPod touch could remain in the company's product lineup unchanged for some time to come. The company took the same approach with the iPhone SE when it debuted in 2016, giving it the same A9 CPU as the then-flagship iPhone 6s. The approach allows Apple to leverage its economies of scale, and to ensure its low-end devices do not need updates as frequently as premium models. The minor iPod touch refresh and pricing adjustment came along with the apparent discontinuation of the iPod nano and iPod shuffle. Previously, the iPod classic was killed in 2014 after 13 years of iconic service. 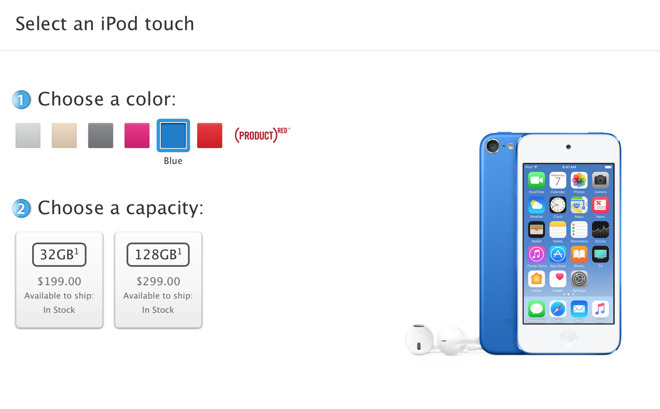 With Thursday's changes, the iPod touch remains the only iPod available in Apple's product lineup. The "Pod" name won't be going away entirely, however, with Apple's forthcoming HomePod speaker bringing a new direction for the branding. Shoppers looking to save even more on an iPod touch can take advantage of the 32GB model for $199.00 at Apple authorized reseller B&H Photo with free shipping and no sales tax collected on orders shipped outside NY and NJ. The 128GB config is also available for $299.00, also with no tax collected in 48 states.